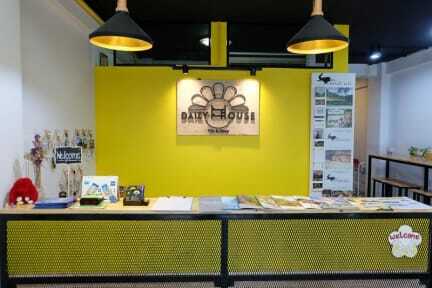 Daizy House is the hostel that located at the quiet alley on the last lane of Sirimangkalajarn Road and just a few step walk to the popular neighborhood Nimmanhaemin road which surround with many coffee shop and restaurants. You can take the Rod Dang (Red Song-taew) from bus station, railway station or the airport to Soi Champi, Sirimungkalajarn road. My experience here was awesome. The owner was really friendly and accommodating. The beds here were very nice and comfortable, the beat part was the curtain on all the four sides. Also, the lockers were perfectly sized for keeping the valuables safe. I met some really amazing people who were living here for a while already, I was not willing to leave this place, but then I had travel plans. Miss this place so very much. If I ever visit CM again, I will definitely choose this hostel. It’s hard to review this hostel because the staff were really nice, it’s incredibly clean and the beds are really comfortable, breakfast was good however it didn’t feel homely and the location isn’t ideal as it’s a long walk to the city. There was little social interaction between guests and it was super quiet. I really enjoyed my stay here but personally I prefer a bit more of a social atmosphere so have moved to another hostel. We have never had friendlier staff (thanks La-La! ), they were so nice! Great location less than 5 minute walk from the main Nimman sois. Nice simple breakfast set up, a kitchen for guest use, and free bottled water (refillable bottles). Only downside was the ensuite bathroom was actually across the hall, and the common space was a bit tough to meet people (this was fine for us though).